At Mariann’s School of Dance, we take pride in giving our kids tons of opportunities to learn and grow not just as dancers, but as people. On top of our regularly scheduled dance classes that perform in recital, Mariann’s School of Dance is home to two Performance Companies with different values and goals. Today on the blog we wanted to feature the fabulous Terpischore Dance Company, our competition dance team that stuns us each and every year. Competition days are buzzing with excitement, but also require tons of hard-work. Ask any of our company members and they will likely tell you that competitions are SO much fun. But what they don’t realize is that they are learning valuable life skills on top of all that fun… which is OUR favorite part. So we are walking you through the big day! 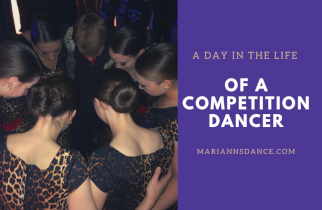 Keep reading to experience a day in the life of a Terpischore Dance Company member on Competition Day. Competition day for our company members usually starts at the crack of dawn. Why? Because there is just SO much to do before you hit the stage. Our team must look professional and uniform on-stage, so hair and make-up is super important. Each dancer spends the morning applying their team make-up and sleek hairstyle to look exactly the same as their team-mates. They pile on the hairspray (and pack it for touch-ups later) to make sure their buns are secured for the entire day. Let’s not forget about the sparkly costumes! On the morning of competition day, a dancer pencils in a HUGE chunk of time for packing their bags. They must handle their costumes with GREAT care while travelling to and from competitions, as they are covered in rhinestones and must look sleek and smooth when they hit the stage. The judges will notice if you don’t have your hairpiece or accessory on, so dancers must double and triple check their bags for all the essentials. Make-up, hair supplies, snacks, and LOTS of water are also on the list of competition must-haves. Dancer Takeaways: Responsibility and commitment to their team must be a high priority for any Terpischore Dance Company member. If your hair falls out on stage, or your dance’s score was lowered because of a missing costume piece, you are letting the team down. Additionally, competition day teaches a kid how to successfully plan ahead, be responsible for their belongings, and make sure they have enough food/water to fuel their bodies. That’s a skill that even adults need to practice sometimes! As dance teachers, witnessing our kids feel the pre-performance buzz is so much fun! We teach our kids that it is NEVER a good idea to step on stage without a proper warm up. After getting their costumes on, our company members spend some time getting their bodies warm backstage. While listening to their favorite upbeat playlist, they do some cardio, stretch out their splits, and run through their dances with the team. Group cheers and huddles are also included in their pre-performance rituals which fills our heart to see. On top of warming up, our dancers must carefully schedule their time throughout the day. They must keep track of what time their dances are scheduled to perform and constantly check to see if the competition is running behind or ahead. There is nothing worse than losing track of time and frantically running on stage. Dancer Takeaways: Pre-performance responsibilities teach our kids how to prevent injuries and care for their bodies amidst all the competition chaos. We require that they prioritize their warm-up to stay healthy. Additionally, time management is a HUGE part of competition day. It takes practice and careful planning to keep track of all their dances and hit the stage feeling prepared. After all that prep-work, it is finally time to hit the stage. Once the music starts and the lights come on, we watch as our dancers spin and soar. It’s amazing how the stage makes our kids come alive and transform into powerful entertainers. The stage time makes the months of difficult rehearsals all worth it. Ask any of our dancers, there is NOTHING like strutting off stage after nailing your routine. The judges were watching, but their scores only matter a little when you feel that awesome! Dancer Takeaways: The competition stage teaches our dancers things that we aim to teach them all year. Performing forces a dancer to forget their insecurities and be confident in their own skin. There is no hiding on stage, which can be great for kids learning how to trust themselves and overcome their fears. We love seeing them just GO for it! Once all the dances are complete, our kids anxiously await the results. Each dance is given a score (silver, gold, platinum) and then the top overall scoring routines are announced. All the studios at the competition listen for the results and the highest scoring dances receive giant trophies. It’s fun and rewarding to watch all your hard work pay off! We LOVE watching our kids’ faces when their dance wins an award or is recognized by the judges! Dancer Takeaways: While we love hearing our name called, we also teach our kids that competition day is about more than just the trophies. We encourage our dancers to congratulate other teams on their victories and always maintain a positive attitude even when their scores aren’t high. They learn sportsmanship and perseverance on top of experiencing the glitz and glam. We end all competition days with a team huddle where we congratulate our dancers, win or lose. Team time and positivity is so important! There you have it, a day in the life of a competition dancer! If hearing about the big day got YOUR adrenaline pumping, we would love for you to join our team. Auditions are held in June, so stay tuned for all the details! We love watching our kids hit the stage and become better dancers, people, and team members. It’s SO rewarding! We know its only March, but trust us, our annual Spring Performances will be here before we know it! So exciting! 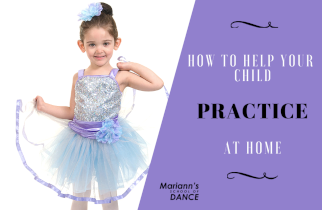 If you never danced as a kid or if you are a new dance parent, you might be a little lost when it comes to how to prepare for a dance recital. There’s a lot to think about! One of the best things you can do to help your dancer prepare is to practice at home! We want our dancers to shine on stage, so today we are sharing 5 tips for practicing their recital dance at home. The studio will be sharing each class’ cut recital music and videos of the routines with our families. It is our goal to give you everything you need to practice, practice, practice! Be sure to download these resources and maybe find an old device to store them on and give to your dancer. They can watch the videos before they go to bed, and listen to their music on their bus ride to school each day. Visualizing is a great starting point for practicing at home. We know it can be hard to find the time to get up and practice every day. Taking 3 minutes each day to sit down, close their eyes, and envision themselves nailing the routine can make a huge difference. Sometimes getting our kids to really believe in themselves is the most difficult part! How do we study for exams at school? We take detailed notes and then read them to ourselves over and over until it's in our brains for good! This can be helpful for dance too! Writing the steps down on paper will force your dancer’s brain to remember the moves without the extra help of their muscle memory. Then when they go to do their dance, their brain will know the sequence and they can start to focus on their performance skills! This one can be really eye-opening! Have your dancer perform their routine in your living room while you videotape them. Then watch it together! Take note of all the times where they had a “mind-blank” or when they hesitated to do the next step. This will tell them which parts they need to practice and repeat over and over. Also, take notes of all the times where they dropped their smile because they were thinking too hard. Seeing themselves on camera gives them a whole new view of what they need to work on! 5. Host mini-performances at home! This one is our FAVORITE. Fun fact, many of our staff members at Mariann’s remember doing this as a kid! Encourage your dancer to put on a pretend dance recital. They can even make tickets and “sell” them to everyone in the house! Take advantage of visiting family or friends that stop by, and encourage your dancer to perform for them. Putting on a performance for people they feel comfortable around is a great way to build their confidence leading up to the big show. We are SO excited for our upcoming performances in June. We know our kids will NAIL it, especially if they follow those 5 awesome practice tips! For MORE tips on how to prepare for a dance recital, check out our blog post from a few months back. Don’t forget to save the dates: June 2nd and June 8th. Click here for all your essential recital info! We will see you and your dancer there, ready to SHINE! We know we are little biased, but dancing is definitely our workout of choice. In any given class, we are building their cardiovascular fitness, muscle strength, flexibility, and coordination. We love seeing our dancers grow into strong athletes through the years. And let's be honest, dancing is so much fun that most of the time, we forget that we are even working out! Getting lost in the groove of the music is invigorating. The exhaustion comes later and it feels so good! Sometimes words just aren’t enough to convey how we are feeling on the inside. Dancing lets us step out of our everyday reality and step into an environment where we are free to express anything we are holding back. When dancing, our bodies become tools for communicating in a fresh new way. Our movements become expansive, we take up space with our bodies, and we feel HUGE on the inside and out. It’s truly an amazing feeling! Ask any of our teachers at MSD, and they will likely tell you that they learned their self-confidence from their dance training! There is something magical about watching yourself in the mirror as you soar through a grand jeté. Stepping into the studio every day is a constant reminder that our bodies are capable of amazing things. Not to mention the confidence boost a dancer gets after jumping on stage and performing for an audience. Performing forces you to trust yourself and feel good in your own skin. We are forever in love with dance for helping us learn to love ourselves. Whether it be through a performance on stage our simply sharing a dance with friends, dancing brings people together. Entertaining an audience is a rewarding feeling. Exchanging smiles with friends while dancing together spreads joy all around us. We feel the love every day at MSD, and we hope that love makes it far past our studio doors. You’ve heard our thoughts, and now it's YOUR turn! Stop by our front desk and fill out a heart telling us why you LOVE to dance. We will proudly display the hearts on the walls of our studio. Parents and dancers, we encourage you all to take a second and read through the hearts. It’s a great reminder of why we do what we do! Happy Valentines Day from all of us here at Mariann’s School of Dance! Dancers, spread the love by wearing red to your dance classes during the week of Feb 7th-14th! Happy New Year to all of our dance families! We are SO excited to be back, and we are even MORE excited to begin teaching our students their recital routines. We love showcasing our students and celebrating their hard work! This year, our Annual Spring Performance for dancers ages 5 and older will be held Saturday, June 8, 2019, at Paramus Catholic High School. Dancers ages 2½ - 4 participate in our Stars of Tomorrow Performance on Sunday, June 2, 2019, at the Fair Lawn Community Center. The opportunity to perform on stage is so valuable for kids. Not only does it build confidence and work ethic, but it gives them an opportunity to share their joy in front of a loving audience. Year after year, our spring performancesare a highlight for our staff, dance families, and students and one of our favorite traditions! We all want to help our students do their best on stage and feel great about their performance. Follow these 5 tips, and your dancer will be sure to ROCK the stage this spring. Ask any of our teachers, and they will all say that success at our spring recital is directly related to how often a child comes to class. Every class we teach is packed with valuable information that will better your dancer’s skill set. Not to mention, they will be learning their recital dance and perfecting the choreography each week. So it’s no surprise that frequently missing class can set a dancer behind their peers. As recital season gets underway and your schedules become jam-packed, we encourage you to continue prioritizing attendance at dance class. Trust us, it will pay off on stage! While we take great care in making sure our dancers are prepared for the big show, we also know that practicing their dance once a week is sometimes not enough. Not thinking about their choreography the moment they leave the dance studio leaves too much room for memory gaps. Practicing their recital dance at home once or twice a week can really make all the difference. We make it easy to do so by emailing you their custom-cut music tracks and posting videos of the dances on youtube. If you need help accessing those resources, any of our staff members will be happy to help you out! If your child is struggling with remembering the steps or mastering a specific skill, NO need to worry! We have ALL been there, and we know that every child has a different set of strengths and weaknesses. Feel free to chat with your teacher before or after class and ask for help. We can offer individualized tips, exercises to do at home, and specific things to think about during class. Plus, if they are struggling with a specific skill or section of the dance, chances are they are NOT the only one! When we know what our students need help with, we can spend extra class time in that area to help them succeed. After working hard all year and perfecting their recital dance, we hate to see students frazzled about logistics when they get to the theater. Forgetting a costume piece at home, having the wrong color tights, or being late to the theater can really impact a student’s performance. We know there is a lot to remember, so we take great care in putting together our recital materials for Parents. All of the materials are accessible on our website, just click here. By reading these materials thoroughly, you are setting your child up for success at their big show! Getting up on stage and performing for an audience can be scary! 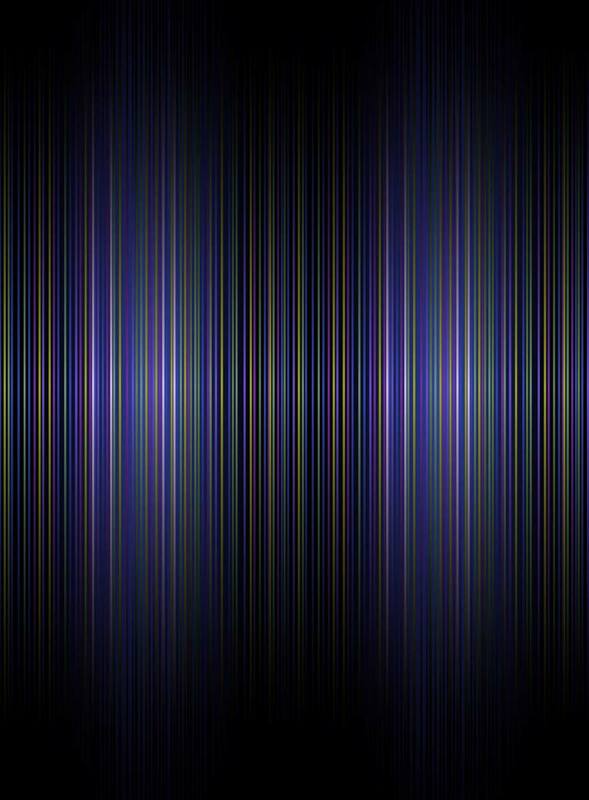 Nerves can sometimes psych a dancer out and we’ve found that the best way to calm those nerves is to show unwavering support. When your dancer knows that you will be their biggest fan no matter what happens on stage, they will be confident. That confidence will shine through in their dancing. We know you love your dancer unconditionally, and there’s never a bad time to remind of them that. We know recital season can be stressful for parents. After all, you just want your dancer to ROCK IT! We want to thank you all in advance for your support, time, and energy leading up to the big day. We hope our 5 tips will set your child up for a fabulous performance! Happy New Year, and more importantly, happy dancing! We can’t WAIT To see our dancers shine on stage this June! Happy December! It is officially prime time for holiday shopping. Don’t know what to get your dancer this year? We’ve got you covered. We have put together a list of our favorite gift ideas for dancers. Here are ten gift ideas for dancers that any student would love. Happy shopping! 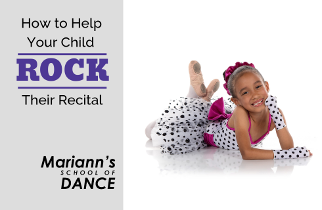 We are biased of course, but we think a gift certificate to Mariann’s School of Dance is a GREAT gift option! When you give a session of dance classes, you are giving a gift that gives LONG after the holidays are over. A gift certificate can allow a child to add a class or experience dance for the first time. A great gift idea for Grandparents or relatives wanting to give an experience. Learn more about our classes here and contact the studio to purchase a gift certificate. We are still accepting enrollment in most classes! This kit is the perfect antidote to sore muscles! These items will come in handy during the first week back from Winter Break. They are also ideal for warming up and cooling down before class and after class. They are small enough to fit in a dance bag and keep close during competitions, recitals, performances, and auditions. Check them out on Amazon! Don’t forget to swing through our boutique for some holiday inspiration! We carry dancewear, shoes, spirit wear, and accessories in stock that would make perfect gifts and stocking stuffers. Throughout the month of December, most items are 15% off! Mid-school year is the perfect time to gift your child with some fresh dancewear! Check out our boutique online. Every dancer NEEDS these in their life! There is nothing worse than trying to practice a dance with corded earbuds that get tangled and fall out of your ears mid-pirouette. These earbuds stay securely on your ear while dancing. They connect to Bluetooth so you don’t have to hold your device in hand. The sound quality is great for an affordable price. A magazine subscription is great for a dancer that likes to read and stay updated on all things dance. Dance Magazine offers inspiring stories and tips from the pros. It often gives audition advice and lists for summer intensives, workshops, and college dance programs. Grab a year-long subscription on Amazon. Dance Spirit is another great choice for a passionate young dancer! Misty Copeland is an inspiration to dancers of ALL ages. Her story is a great reminder that with hard work and dedication anything is possible. She has overcome so much to become the ballerina she is today! This edition is perfect for dancers in 4th-9th grades. Have an older dancer? The original version would be a great choice! Have you heard of growth mindset? This journal teaches children to embrace challenges, to persevere, and how to grow from feedback. These skills are so important and translate to the work we do inside the dance studio. The Big Life Journal would be perfect for dancers of all ages. The Caboodle is back! Dancers tend to acquire a lot of accessories. Between the bobby pins, hair ties, and performance makeup; it can quickly get overwhelming! This would be a great option for dancers to keep their things corralled and organized. They will be more than ready for the next performance! TheraBands are great for muscle strengthening and injury recovery. They are an essential addition to a young dancer’s dance bag. Resistance bands are a great way to work on strength outside of the classroom and to fire up the most important muscle groups before class. Get the set of 3 different resistance levels on Amazon. This last one is a fun one specifically for our younger dancers. If your little one can’t get enough of JoJo and her bows, this doll might need to go on your list! JoJo is a singing and dancing sensation. She encourages girls to be confident and speaks out against bullying. That is a mission we can get behind! Are you feeling inspired? We are so fortunate to have dancers that are passionate about the performing arts. We love coming up with gift ideas that support their passion! Hopefully, these gift ideas put a smile on your dancer's face. We are sending warm wishes to all of our dance families this holiday season. Happy holidays from all of us here at Mariann’s School of Dance! Our staff loves teaching and watching our students grow both in AND out of the dance studio. For us, dance is so much more than just a hobby! 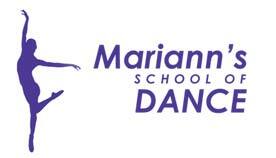 Mariann’s School of Dance teaches dance as a total art form. Our dancers develop technical skill and discipline as well as a strong sense of theater, musicality, and expression. We strongly believe that the skills our students develop at the studio are skills they will carry with them for a lifetime. 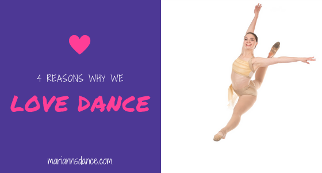 This one may seem obvious, but dance requires an incredible amount of athleticism! Involving the entire body, dancers utilize strength, endurance, flexibility, and coordination. Dance also requires a large range of motion. Our classes are a great way for young children to improve their motor skills. Dance also encourages students to develop healthy habits and a love for movement. Dance classes encourage self-expression. Students are encouraged to bring their emotions into their dancing. They learn how to express ideas using their body and communicate with others nonverbally. Dancers and artists often have a greater sense of emotional maturity and self-awareness, which can be of great value as one moves through life’s challenges! 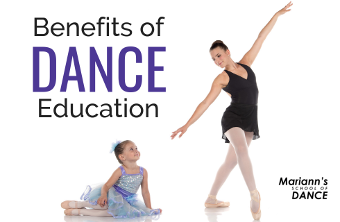 Dance education provides a child with cognitive benefits in addition to physical benefits. As opposed to a typical school setting where students learn by listening to a teacher or reading a textbook, a dance class allows a student to learn by doing. In class, dancers use their bodies to actively work through concepts as they are learning them. Additionally, dance improves a child’s memory skills, as they are asked to remember steps and choreography from week to week. This requires not only mental concentration but strong muscle-memory! Dance can sometimes be considered an individual pursuit. However, in our classes and dance companies, we teach our students how to work within a group dynamic, engage with others, and respect the people around them. We value classroom etiquette and teach our students to take every correction from the instructor as their own, whether it was given to another student or them directly. We encourage our dancers to cheer each other on, recognize other dancers’ strengths, and use each other as role models to better themselves. We also greatly stress the importance of spatial awareness, as dancers must learn how to dance freely while simultaneously respecting the personal space of others. Dancers learn self-confidence, which is particularly important for children as they move through different stages of development. The opportunity to learn dance steps and perform for an audience can be extremely valuable. Performing is not easy! It shows them just how much they are capable of with dedication, practice, and the support of their teachers and classmates. We love seeing our students accomplish the goals we set out for them and there is nothing more rewarding than teaching a child to be confident in their own skin. Dance education is SO important and we LOVE what we do. Dance education provides children with opportunities to develop and grow as dancers and as people! It is an honor to share this art form with our students and witness them grow year after year. If you want to try out our classes and see the benefits for yourself, check out our class schedule! We would love to meet your family and we are SO excited for another great year of dance!